If you are a business owner and your property has outside doors, and you need to have an exit device installed, repaired or replaced then you are in the right spot. ATL Locksmith Pros are professional locksmiths who are fully equipped with the right tools and knowledge in fixing exit devices. It’s required that industrial and commercial buildings like schools, hospitals, retail stores and office buildings be fully compliant with fire and life safety code requirements. For a sound building security, the owners of these buildings must make sure the exit doors are fully functioning. Exit devices are designed in a special way to ensure that many people can exit a building in case there is an emergency without being stuck behind locked doors. Our locksmiths are your best fit for exit device services since they are fully certified, licensed and have tons of experience in this field. We make sure that your exit devices will work perfectly with your property .We install repair and replace with the best brands in the market. Exit devices are very essential in case of a fire hazard hence owners need to seek for our services. This type is mounted on the inside surface of the door. It’s used on single doors or doors that are in pairs and have a vertical mullion .A mullion is a bar that is either fixed or removable and is placed between the doors. These exit devices are easy to install, maintain and adjust. The rim devices are of different styles and are field adjustable to fit the width of any door. They provide a full entry and exit security solution to any door or gate irrespective of the size or weight. They are designed in a special way such a way that they can be fitted on the inside surface of any door. Our locksmiths are well trained making it easy to install. They are cost effective and are suitable for small sized commercial buildings. 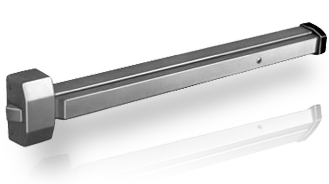 It’s a type of a crash bar that has its locking mechanism mounted into a cavity in the door. These devices are designed for large and medium sized commercial buildings. They are durable and most preferred for hospitals and schools. There are different mortise brands. Our locksmiths will install the one that fits your taste and preference. It gives additional security and is designed to be used on wood and metal doors. They are best suitable for big commercial buildings where safety and security is of major concern. In addition, they perfectly fit any type of building. They have vertical rods and provide additional latching at the tops and bottoms of doors. They are best used when aesthetics play a strong factor in door design. 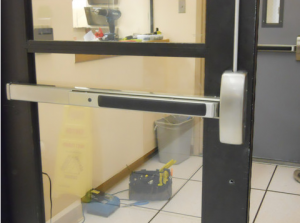 We specialize in installation, repair and replacement of all exit devices. 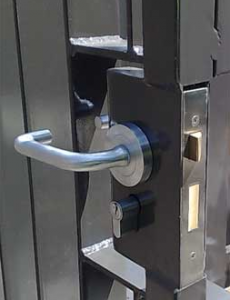 For reliable and expert services, call our locksmith to install exit device today and secure your building. We provide utmost security in Atlanta and surrounding areas. I needed a couple push bars installed on my building and these guys had the best quote. They were very professional and got the job done right. I recommend them on all commercial locksmith needs. Very professional group as well as inexpensive. They installed an exit device in my office building and had the job done in no time at all. Will use again!